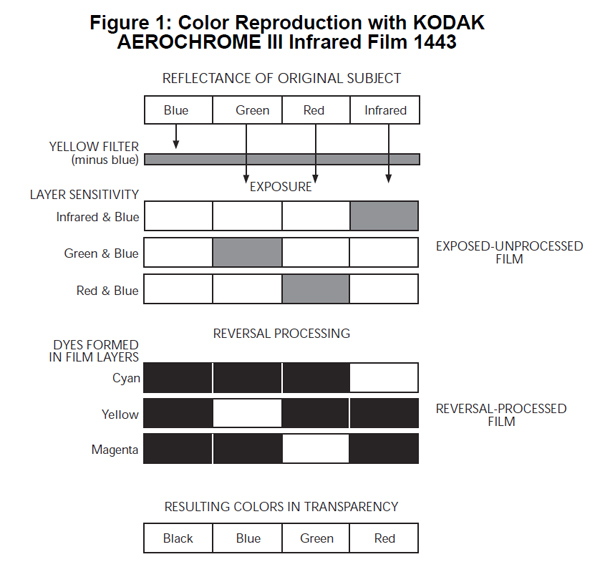 Kodak Aerochrome is a false colour infrared (CIR) film. 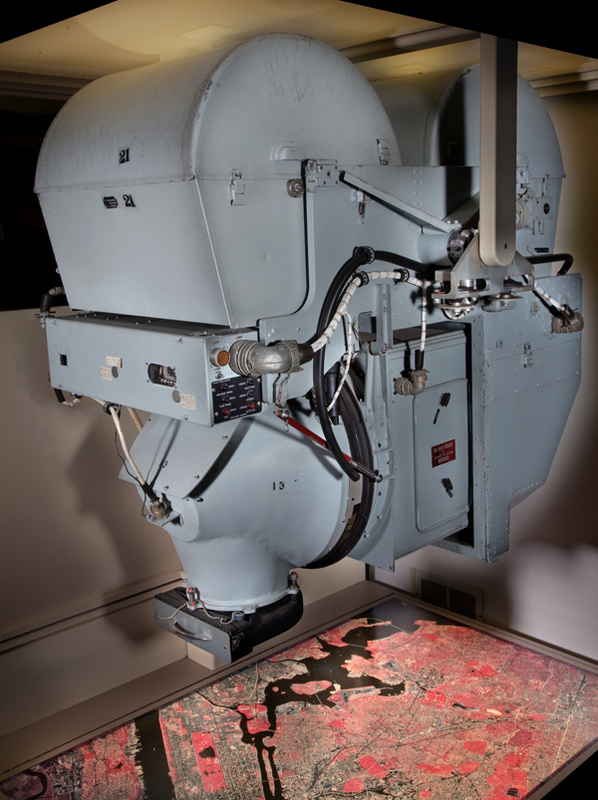 Originally conceived in the late 1940’s for military surveillance, this unique emulsion has seen many uses in both scientific and artistic applications. Kodak’s listed examples include; Camouflage Detection, Pollution Monitoring, Forest Survey, Archaeology and Ice Reconnaissance. 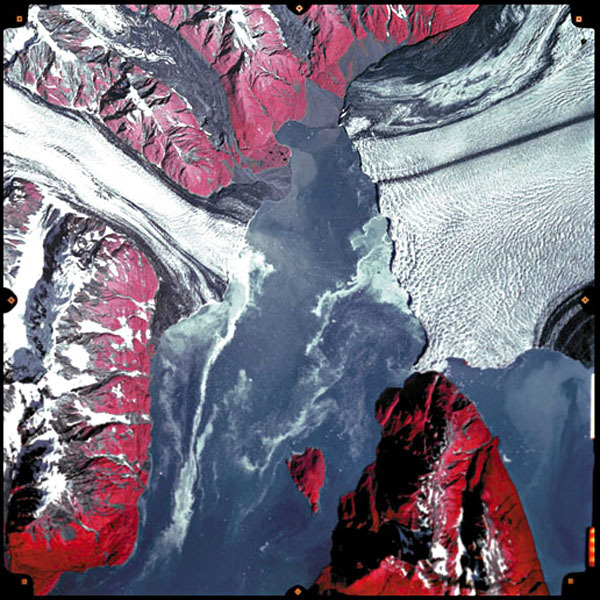 Aerochrome was discontinued by Kodak in 2011 due to a decline in demand. This can be attributed to the evolution and conversion to digital for most remote sensing and aerial imaging operators. 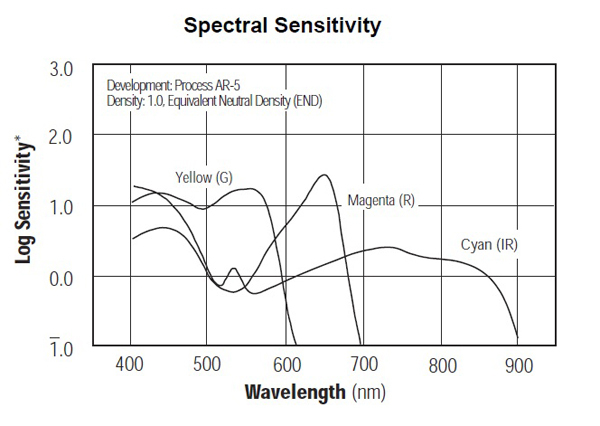 The process by which Aerochrome converts light into the false colour infrared images we see, is shown below in the diagram from Kodak and should be read in conjunction with the spectral sensitivity curve following it. The basics are that blue light (the lower end of the visible spectrum) is largely omitted by the yellow filter. The IR light (near-IR part of the spectrum from 700nm to 900nm) is captured on the cyan layer of the film. When reversal processed this leaves yellow and magenta which equates to that ‘red’ look we associate with Aerochrome. In addition, green and red light are converted to the colours of blue and green respectively. 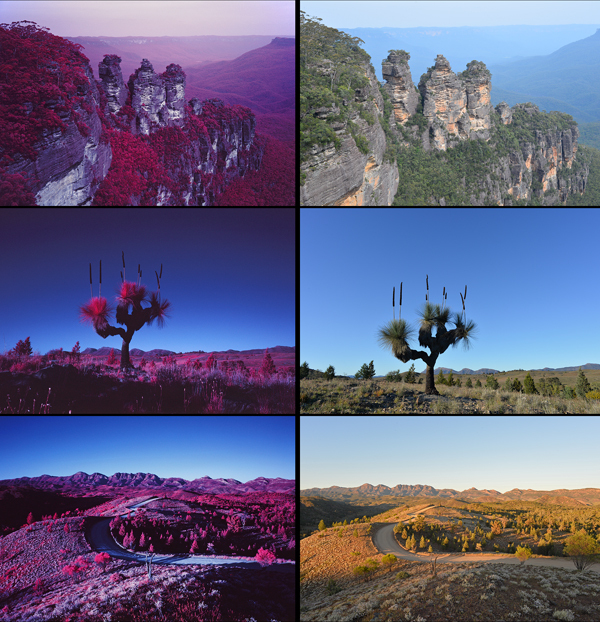 The best way to understand how to effectively shoot Aerochrome is to take a visible light image of the scene at the same time. Not only does this act as reference point (or light meter if you need it) it also reveals what is reflecting IR energy well and what is absorbing it. As a general rule Aerochrome is best used in broad daylight (approximately 400 ASA at ground level though I find 320 ASA is better for older stock). Images should be exposed for the shadows as detail is quickly lost. Any cloud cover or overcast weather (IR radiation is heavily absorbed by water) must also be compensated for. 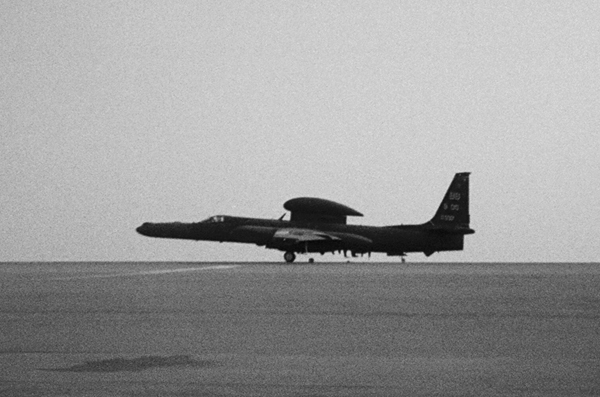 As mentioned, Aerochrome was originally designed for reconnaissance and camouflage detection by the US military. It has seen many years of service in aircraft like the one pictured below, the Lockheed Martin U2S or Dragonlady.